A strong long par 4. 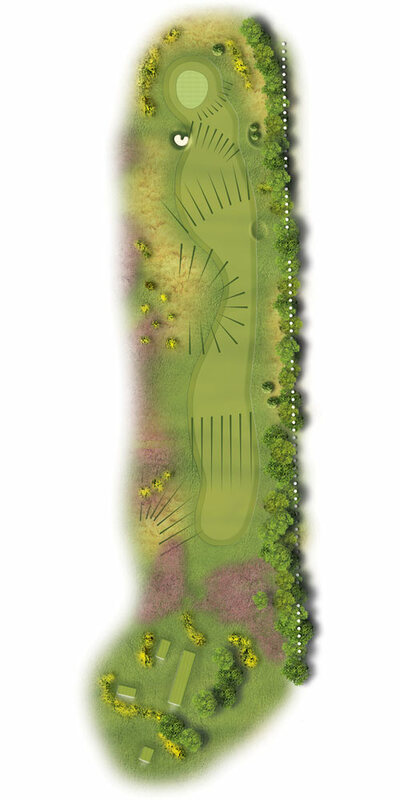 A driver will probably leave your ball in a small valley and play from light rough with a blind second shot. However it only leaves a mid-iron. A long iron/fairway wood will keep you on the fairway but leaves another long iron/fairway wood to the green. Again a three shot strategy is the preferred option. A drive onto the large fairway followed by a fairway wood kept to the right hand side avoids all the trouble. If running your ball in favour the right as the ball feeds in from this side.